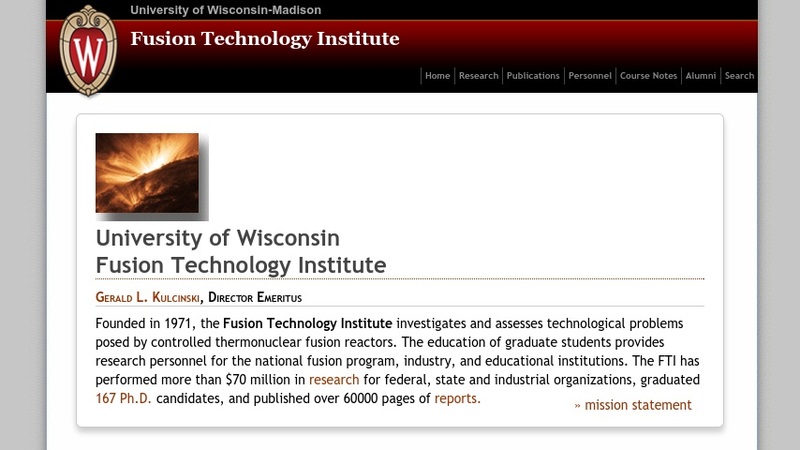 The Fusion Technology Institute at the University of Wisconsin - Madison provides this website to describe its many research initiatives to "develop clean, safe, and economical fusion energy sources" and to "create near-term commercial products that use fusion energy to enhance the quality of life." The research projects are divided into three main categories: Magnetic Confinement Fusion, Inertial Fusion Energy, and Other Applications. For each project, users can find a short description, related links, and a list of publications. The website offers downloads of numerous poster sessions and talks.